I think most of us in the Writer’s Asylum are realistic about the limited opportunities for financial profit from our writing. I wrote in March about some of the outlets for creative writing that have arisen as a result of changing technology. 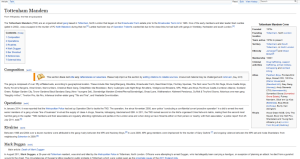 Recently someone posted a link on a friend’s Facebook wall to another example – I’ve taken a screenshot as well as providing the link, as the nature of Wikipedia means that things can change rapidly – however the entry has been up there for at least a couple of weeks now. Previous blog not updated regularly enough for you? Next who has read the works of Herbert Quain?